There is nothing like leather inlay to show off your logo. 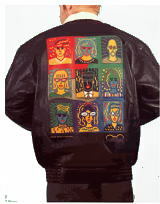 This custom leather jacket was done for eyetique. An original Burton Morris design. Call Robert Schiloni to talk about your custom leather jackets or custom leather accessories for your school team or club.